Celebrate Taco Tuesday with TCDG! Show your team spirit by joining us for a fundraiser to support Twin City Derby Girls and keep roller derby alive in Champaign-Urbana. Come in to the Chipotle at 903 West Anthony Drive #A in Champaign on Tuesday, June 27th between 4:00pm and 9:00pm. Bring in this flyer, show it on your smartphone or tell the cashier you’re supporting Twin City Derby Girls to make sure that 50% of the proceeds will be donated to TCDG! If placing an order online during the fundraiser, please note that you must choose the “pay in-store” option and tell the cashier about the fundraiser before paying. This will ensure that your order is counted towards the fundraiser! Every dollar counts! Click Here to get a copy of the flyer! On Friday June 2nd (National Donut Day! ), from 7-10am, we will have boxes of Krispy Kreme Donuts for sale at the corner of Kirby and Oak! Drive or walk by and grab a dozen Krispy Kremes for only $10 a box! We don’t have Krispy Kreme Donuts in Champaign-Urbana, so be sure to get yours while they last! Pre-orders available online at tcdgdonuts.bpt.com and must be paid at time of order, sorry no exceptions. Pre-orders may be picked up by the buyer between 7-10am at the corner of Kirby and S. Oak during the time of the fundraiser. For more details or if you have any questions, check out our event on Facebook! WHEN: Wednesday, May 24 from 4:00 to 8:00 pm. WHY: to raise money for Twin City Derby Girls, a 501(c)3 non-profit and Champaign Urbana’s premiere adult roller derby league! We are raising funds to cover our league’s operational expenses so that we can continue to play roller derby and serve our community. 1) Spread the word! Please click “Share” at the top of this event and invite your friends, family and coworkers so Facebook will remind them on the day of the event. Your challenge is to get ONE person besides yourself to order at Panera with a flyer during the fundraiser. 2) Show the flyer when you order! A printed flyer OR an electronic version of the flyer on a mobile phone/tablet must be presented when ordering. Click this link for a copy of the digital flyer to show on your phone. 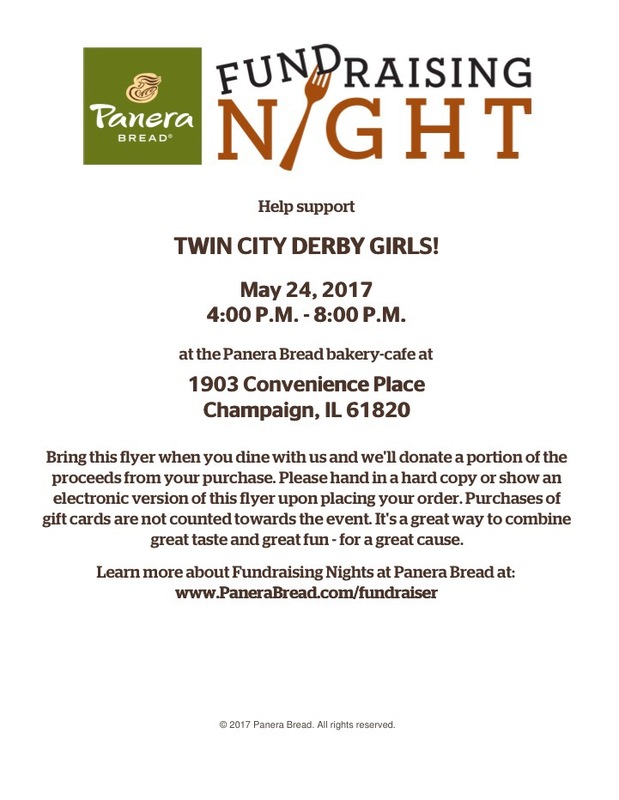 Panera will give TCDG a donation based on the amount of flyers presented during the fundraiser. * 50+ flyers: 20% of net sales from redeemed flyers <<<THIS IS OUR GOAL!! Our 14-week Roller Derby Training Program offers a fun and supportive environment for skaters and referees who want to learn and fine-tune the basic skills necessary to play or officiate roller derby. Anyone who is 18 years of age or older (as of February 21, 2017) and can skate is eligible to train to be a skater or referee. TCDG welcomes people of all gender identities to be part of our organization. There is a $20 fee due at registration to cover equipment and facility fees. To pre-register, please email tcdgmembership@gmail.com or send us a message on our Facebook page to register. down payment toward first month’s dues. Monthly league dues while in the Doppel Gang program are $50 per month (total of 3 months). Gear to Bring: Everyone starting the training program MUST bring their own mouthguard (available for $2-$3 at most retail stores like Target, Walmart, Meijer, etc.). Be sure to boil and mold your mouthguard according to the manufacturer’s instructions before you arrive. When fitting, please ensure that it covers your back molars. It is also strongly recommended to bring your own helmet. Everyone skating must wear quad skates. Please bring your own if you have them! TCDG has loaner skates available to new training program members who haven’t yet purchased skates. Supplies are very limited and we cannot guarantee that we have enough in each size for every person. Pre-registration helps ensure loaner skates in your size. Wristguards, knee pads, and elbow pads are also required safety gear. The league has an assortment of loaner gear available for new skaters. Again, if you have any pieces of your own gear, please bring them. Derby is a competitive sport. We take our league, the safety of skaters and our training program very seriously. No exceptions will be made for the gear requirements. The TCDG Doppel Gang Training Program is a 14-week curriculum in which you will work individually and as a group to get your basic skills up to speed. Please do not hesitate from trying our program because you feel you don’t have the basic skills perfectly down pat. If you can skate, we can train you! Specifically, these skater skills are assessed for proficiency and aptitude. Again, no worries if you aren’t familiar with them. We will teach you and track your progress! Skating posture: Fluid strides, balance, confidence in skating, pushes off with both feet. Stops: T-stop & plow stop. Sticky Skate: Can propel self with all eight wheels on the floor. Crossovers: Performs smooth crossovers while skating at a brisk pace going into and coming out of turns. Uses both feet to push during crossovers. Squatting: While skating, squat and coast the entire straightaway and turn, squat and propel self on straightaway and turns. Stepping: Steps from a standstill backward, forward & side to side while maintaining balance. Agility: Can move easily and fluidly from one side of the skating lane to the other. Balance: Performs one-foot glides on each skate for the length of the straightaway with good balance. Endurance: Can skate 4-5 laps in one minute on a derby-size track. Skate, Skate, Skate! Attend open skate to practice skills and skate outdoors (outdoor wheels recommended). You can also read over the official WFTDA rules on the WFTDA site here. If you have decided to join TCDG as a skater, you will participate in a 14-week development program as part of our Doppel Gang to help you prepare for the WFTDA basic skills test. If you have joined as a referee, you will train with both the Doppel Gang and our officiating crew, the Ref Riders, to further develop your skating skills and knowledge of the sport. The Doppel Gang is a supportive and fun environment with space to learn and perfect basic skills. It is comprised of skaters of all levels, including visiting, Recreational, and veteran skaters, and referees. Those of us who skate, officiate, and volunteer for TCDG love what we do, and we hope that you will, too. Please stay tuned to this page and our Facebook page for information! Just For Fun: Why did some members of TCDG choose their number? Our amazing, award-winning charity partner, Avicenna Community Health Center, is in need of some specific items to help serve the community even better. TCDG is hosting a donation drive to round up what Avicenna needs! Will you help us out? Avicenna has specifically requested the following items: Dental floss, hand sanitizer, and feminine hygiene products. Please bring these and any other new, unopened personal hygiene items that encourage a healthy lifestyle to the Twin City Derby Girls ticket table at any of our upcoming games. All items donated will go directly to Avicenna Community Health Center. If you have items to donate but can’t make it to any of the upcoming games, please email us to arrange a different drop-off time. TCDG and Avicenna thank you for your support! Calling all Goblins, Ghosts and Ghouls! Almost everyone loves Halloween. The beautiful fall weather, and the chance to finally bring to life that great costume idea you though of on November 1st of last year. It’s also always fun if you can wear said costume on more than just one night of the year. After all, you worked very hard on it. TCDG is giving you that chance! Come to our game on October 15th when the Dames rematch against the Bombshells and wear your best Halloween costume! At halftime, we will have a small costume parade of sorts, and our judges will choose winners for each age group. This contest is open to both children AND adults! We will award prizes for first, second, and third place in both groups. There will be plenty of awesome candy available, as well as other non-edible treats for those with allergies or other restrictions as recommended by the Teal Pumpkin Project. Get creative, get creepy, be whoever or whatever you’ve always wanted to be! Please keep in mind that this is a family-friendly event, and we request no masks on adult costumes. Other than that, there’s no limit on what you can do! CHAMPAIGN, IL, August 18 – While Twin City Derby Girls (TCDG) had planned to launch the 2016 Home Team Series in conjunction with the Taste of Champaign this weekend, unexpected events will force them to make other plans. Inclement weather on Monday evening affected the venue for this weekend’s series opener and the community-based non-profit athletic organization has opted to reschedule the game. The 2016 Home Team Series opener will now be held on Saturday, September 3, at 7 p.m. The [rescheduled] event to begin the home team series marks a return of the three-team intraleague program by TCDG. Home team competition provides opportunities for newer skaters to gain experience, and all skaters can compete without the pressures and travel expenses that accompany away games. Fans that have already purchased tickets to the August 20 game are asked to contact TCDG (twincityderbygirls@gmail.com), where they will receive either a refund or can use their ticket toward any of the seven home team games this fall. Additionally, TCDG is providing event parking for the Taste of Champaign-Urbana event this Friday evening and all day Saturday. Directly adjacent to West Side Park, the convenient parking is located at the McKinley Events Center (500 W. Church St., C.) for $10 per vehicle. All monies raised go toward Twin City Derby Girls, a 501(c)(3) non-for-profit organization. About Twin City Derby Girls: Founded in 2010, Twin City Derby Girls (www.twincityderbygirls.com) is Champaign-Urbana’s premiere flat-track, quad-skating, adult roller derby league. The Twin City Derby Girls aim to promote roller derby in the Champaign-Urbana area community by fostering athleticism, empowerment, and sportsmanship among all of our members and supporters, while benefiting local non-profit organizations through our charitable donations and service. As a local 501(c)(3) organization and competitive member league of the international Women’s Flat Track Derby Association (WFTDA), the Twin City Derby Girls embody the do-it-yourself, “for the skaters, by the skaters” ethos of modern women’s roller derby.